8:00 a.m. and 11:00 a.m.
Communion will be served at all services. The church office will be closed on Monday. We will reopen at 9:00 am on Tuesday, April 23rd. We welcome you to join us on Wednesday mornings for this anointed time of prayer and healing. You will get to learn some very foundational concepts of the Christian faith. No such a thing as a silly question. Come prepared to grow in your faith. We welcome you to join our Missional Community of crafty ladies the 2nd and 4th Friday of every month. ​For more information contact Jacque Manning or Cindy Zelna. If you like to knit or crochet, this is the ministry for you. Beginners welcome. ​For more information please contact Jetty Zarfos. Father's bring your sons to hear our guest motivational speaker, Andy Lyman. Breakfast will be served. 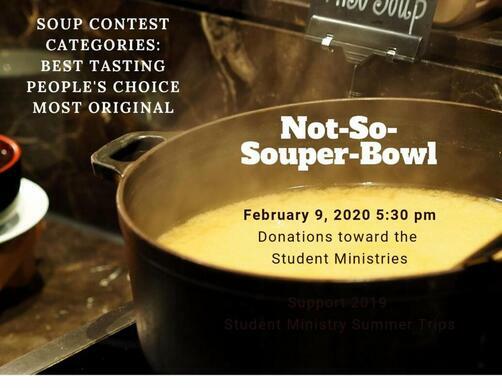 ​Please sign up in Narthex. All ladies invited to join us for our monthly business meeting. For more information contact Nancy Myers. Currently reading "The Alice Network" by Katie Quinn for the May 13th meeting. This epic African adventure engages the whole herd. At Roar, kids explore God's goodness and celebrate a ferocious faith that powers them through this wild life. Each day at Roar VBS, kids travel through field-tested rotations that reinforce relevant Bible Points and immerse kids in new adventures. Entering K - 4th Grades - Roar! Entering 5th and 6th grades be a part of your own special group - Student Safari! ​We are so blessed here at St. John's to have a crew that comes Wednesdays to keep our church grounds looking beautiful. We are currently looking for volunteers to come on Wednesday mornings to help us. ​We have an amazing Movie Group Ministry here at St. John’s. We meet different times of the month to watch an interesting movie together. After the movie we have time for fellowship and we get into some great discussions about the movie we just watched. We have been having a great time and would love for you to join us. For more information, please contact Cindy O’Neil at 941-480-0674. Would you like to SERVE and be a blessing to our children? 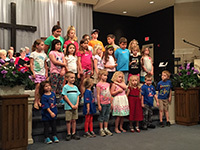 We area always recruiting for all ages—nursery through 4th grades! We have opportunities on Wednesday Nights (5:30- 7:30) and Sunday Mornings (9:30 and 11:00). No experience is necessary, curriculum is provided and little prep time is needed. ​Music is such a wonderful way to honor or bless someone. Each dedicated anthem is $10.00. Please be sure to sign up in the lobby at sign-up central and place your payment in an offering envelope and put in the box labeled "Dedicate an Anthem" (also located at sign-up central). Contact Nicole Smith at 941-925-2661 or email her here with any questions.